Hope you all had a great Thanksgiving! Mine is…over. And we’ll leave it there. I messed with the greatest chocolate chip cookie recipe of all time over the weekend. There’s this restaurant in DC–Teaism–that’s famous for its salted oatmeal cookies. I made those a few years back and they were really good, but not everybody is into oatmeal. So this week, I took that chocolate chip cookie recipe, reduced the vanilla to a teaspoon, and sprinkled the dough oh-so-sparingly with kosher salt once it was scooped onto the cookie sheet, right before it went into the oven. My friends, if you like sweet-salty, you will die. Heaven. These are heaven. I’m not cooking Thanksgiving dinner. I’d be happy to, but my sister-in-law is kind enough to host, and even kinder to invite my family to her house so I don’t have to split the day. I’m on pumpkin pie duty. The recipe on the Libby’s can is the best one I’ve tried. I don’t mess with it at all. I have that and a big bottle of wine, and a small birthday cake for my mother-in-law that I baked this morning, since we won’t see her on her actual big day. I’m thankful for my family and their health. I’m thankful for my Labrigator, who makes me crazy but also follows me around all day long and wags her tail just because I look at her, and forces me to exercise and shows me the joy in the everyday. I’m thankful for my kitchen, which helps me work out things that need working out while I’m mixing and stirring and measuring. Cooking zen. It’s my meditation, my therapy, and my love. I’m thankful for the wonderful teachers in my children’s lives. We’re truly blessed this year. And I’m grateful that we’ve been able to deal with those who haven’t been quite as spectacular and that my kids have an amazing ability to bounce when the ground seems harder than normal. I’m thankful that my job lets me work at home, which gives me more time for everything above. It’s not easy and there are plenty of hurricane days because of it, but I can’t imagine doing all of this any other way. I hope you all have a wonderful Thanksgiving and have more blessings than you can count. And I hope dinner is delicious and that you enjoy the process as much as the result. And lastly, I hope someone else does the dishes. See you next week. Back when DH and I were dating (when the dinosaurs roamed, for those keeping score at home), we had dinner with his parents about every other week or so. 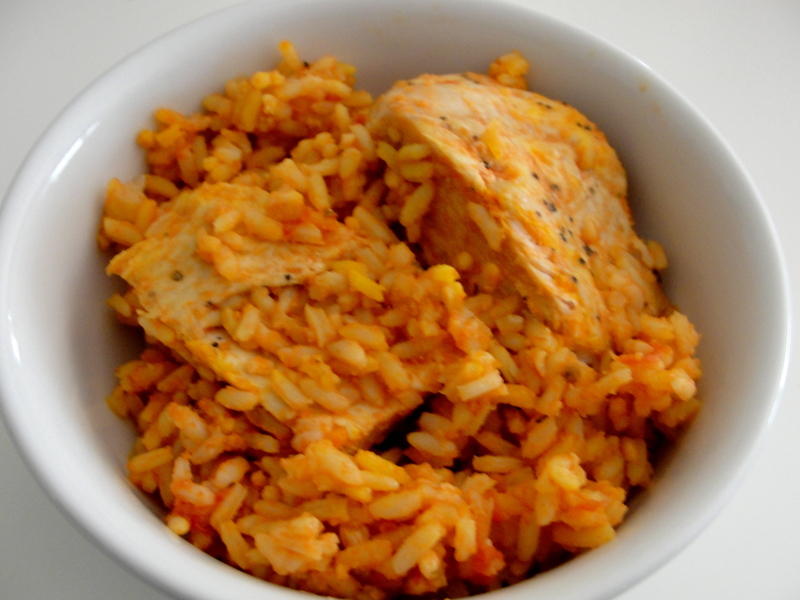 And their family’s favorite dish was this chicken and rice. It’s easy to see why–it’s warm and comforting and not overpowering, and it’s pretty simple to make. It reheats very nicely (doesn’t freeze well–don’t try it), and everyone in my house will eat it, giving them all a good dose of veggies minus the fussing. My mother-in-law got the recipe from her mother-in-law, and I’m not sure how much farther it goes back from there. Several years ago, it was our turn to host their big family Christmas party. I asked everyone in the family to send me their favorite recipes, and compiled them into a sort of cookbook. This is what my mother-in-law sent, and I’m very glad for it. It’s become part of our regular repertoire, and the tradition lives on. I have changed a few things here. The original recipe called for far less chicken broth. Mine never came out, so I’ve added more. I highly recommend starting with half the chicken broth, and adding more as the rice cooks until you get the consistency you want. Your stove, pot, and humidity that day will all come into play. The original recipe called for handling the garlic differently as well. I like my garlic a bit stronger, so use more on the chicken. I also sweat the veggies before adding any liquid, which I suspect my mother-in-law did, but didn’t write down. And finally, I use boneless chicken breasts instead of bone-in. We just like them more. This calls for saffron. It’s very expensive. You just need a pinch, and I find it pretty reasonably at Trader Joe’s. But feel free to omit it. The recipe is different, but just as good that way. There’s something lovely about preparing a recipe for your family that you or your spouse/partner grew up with. I’d love to hear about yours–leave them in the comments. In a shallow baking dish, salt and pepper the chicken breasts and sprinkle them with garlic powder. Let them sit about 10 minutes, and then bake at 350 degrees for 20 minutes (you’re not cooking them through). Remove from oven. In a large soup pot, saute onion, pepper, and garlic clove until they start to soften. Add tomatoes and tomato sauce, and simmer about 20 minutes. Add half of the chicken broth. Add chicken to the sauce mixture and simmer another 10 minutes. Stir in rice. Cook, adding chicken broth as necessary, about half an hour, or until most of the liquid is absorbed (it’ll thicken as it cools). Stir in saffron for last few minutes of cooking. Let sit a few minutes, and serve. Let’s get a few things out of the way here. First, I’m no photographer. This looked better in person than it does here. Second, I’m aware it’s not Mardi Gras and that I probably violated some sort of natural law that applies only in New Orleans by making this recipe yesterday. It was for a baby shower (which explains the pink and blue sprinkles) for a friend of mine who’s from NOLA, and just seemed like a fun way to welcome her new little one. Because first, it’s totally New Orleans, and second, it’s got a BABY inside, y’all! Seriously–is that perfect or what? This started out as an Emeril recipe. 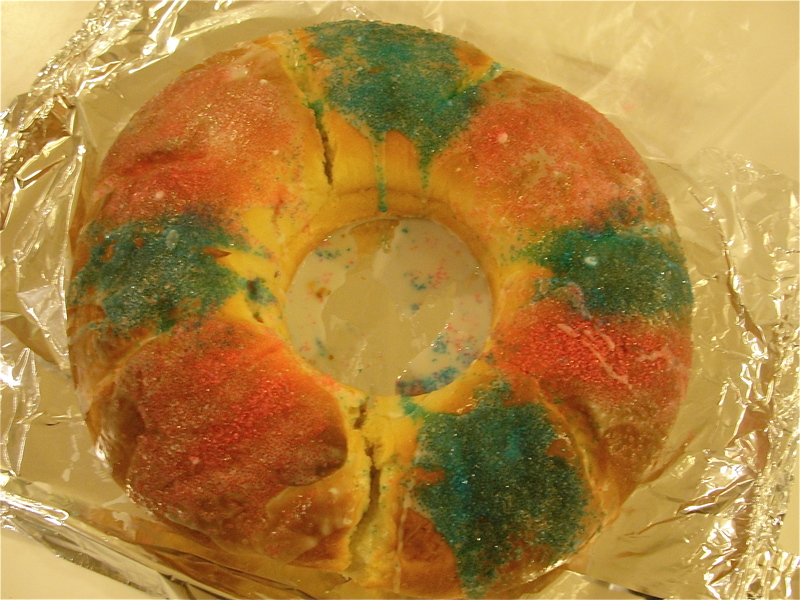 Which is fine, but he has two recipes for King Cake–one with cream cheese and sugar inside, and one with a nutty, cinnamon-y mixture. I, having sadly never set foot in Louisiana and only having had King Cake once before, emailed a high school friend of mine who lives there to ask which was more correct. She picked cream cheese, so off we went. Emeril has a really funky way of proofing yeast. He combines the eggs and butter and milk and sugar, and then stirs the yeast in. I tried it. Disaster ensued. Maybe it works better down south. But it didn’t work for me, and I went back to the traditional way, which is to heat the milk, stir in the sugar, and drizzle the yeast on top. Let it sit until it’s foamy. Foolproof. I used mostly cake flour in this. Cake flour has a much softer crumb than AP flour and made for a pastry-like texture in the final cake (which may or may not be correct but I liked it). You can use all AP flour if that’s what you have on hand. I would not use any wheat, though. It’ll be too heavy. The other thing I did was to make my dough in the bread machine. If yours has a dough setting, that’s easiest. Dump and set and walk away. If not, follow the directions below. The ladies seemed to like my cake. The husband said it was the best dessert I’d ever made. If that’s not a compliment, keep it to yourself and let me live in my little Make Believe Land for awhile longer, ‘K? Thanks. I’ll definitely make this again–likely as individual cakes next time, just to see if it’ll work that way. If you’re making this in a bread machine: Stir together milk and sugar, and then sprinkle yeast on top. Leave it until it bubbles up. Then, dump the flour, butter, egg yolks, yeast/milk mixture, nutmeg, salt, and lemon zest into your bread machine, set it on the dough cycle, and walk away. In a mixer, proof the yeast as outlined above. Using the mixer, stir together that mixture with the butter and egg yolks. Add the flour, nutmeg, salt, and lemon zest to the wet stuff and beat on medium using a dough hook until it forms a ball and starts to climb up the mixer. Then turn it into a greased bowl, cover with a clean towel, and let rise about two hours. While your dough rises, mix together your softened cream cheese and 1/2 cup powdered sugar. After your dough cycle or rise in a bowl, turn the dough out onto a floured countertop and roll it into a rectangle, about 30 inches long by 6 inches wide. Spread the cream cheese mixture down the center of the rectangle. Then, fold the long ends over the cream cheese mixture, pinching them in the center to seal up the dough with the cream cheese inside. Transfer your dough to a large cookie sheet lined with parchment paper (spray that with nonstick spray too, just to be safe). 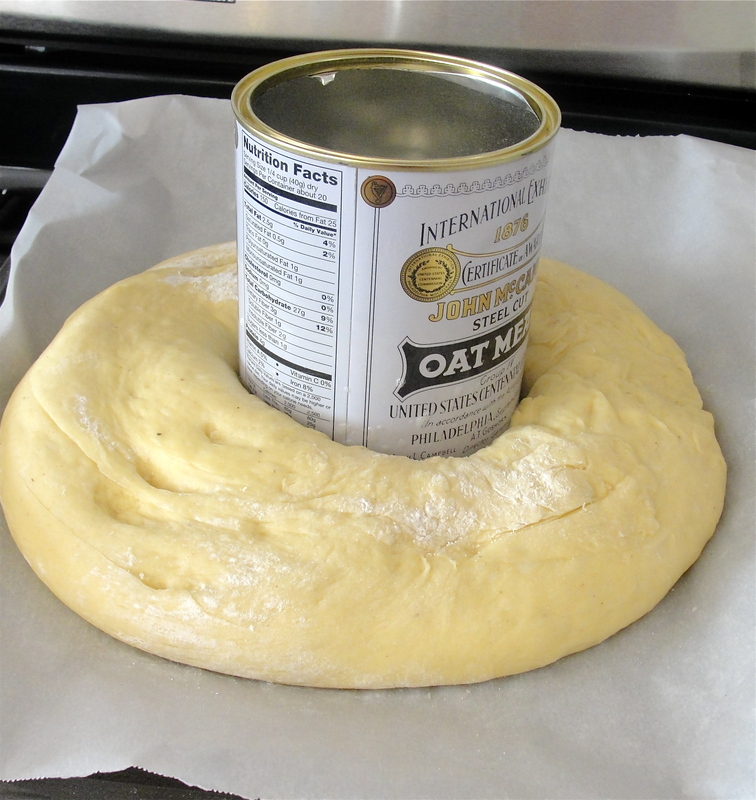 Grease a coffee or other can (I used a steel-cut oats can), and form the dough into a ring around that, with the seam side down. Gently press your baby into the underside of the dough and seal it up. Cover again and let rise 45 minutes. Heat your oven to 350 degrees. With a sharp knife, make slits across the top of the cake, every 4 inches or so. Bake the cake about 30 minutes, or until puffed and lightly golden brown. Remove the can as soon as you take the cake out of the oven. Let cool completely. With a whisk, mix together the remaining powdered sugar, lemon juice, and milk. Pour over the cake, letting the glaze drizzle down the sides. Sprinkle the cake with the colored sugar, alternating colors in wide stripes. Let set and enjoy! My daughter, who is not immune to the ten bazillion holiday commercials already running on TV, has been begging me to make a pumpkin pie. And while I’d love to comply, the problem with baking a pumpkin pie is that then I have a pumpkin pie in the house. And I am (sadly) powerless over such things. This makes for a phenomenal substitute. 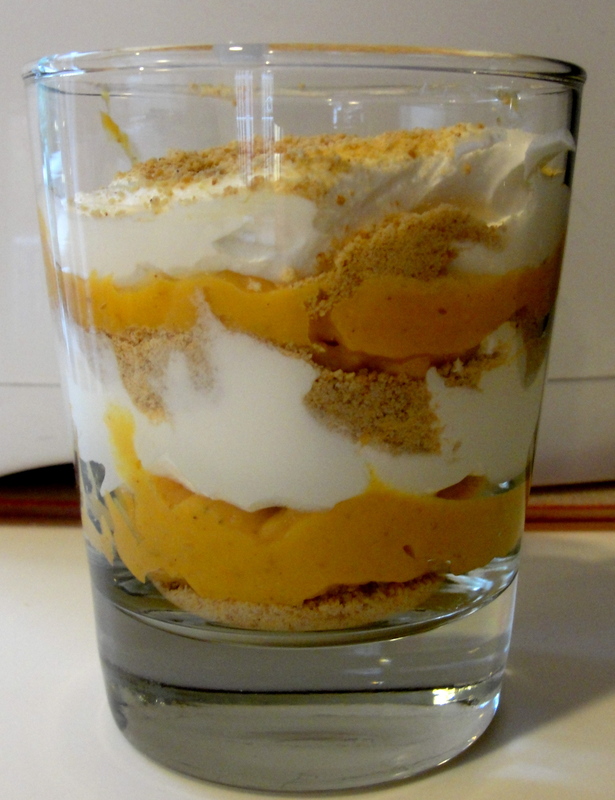 This combines a pumpkin pudding recipe that’s all over the Internet (search for Weight Watchers pumpkin pudding) with layers of whipped cream and crushed graham crackers. All the taste of pumpkin pie without all the sugar and fat. Which is good, yes? You can use light Cool Whip for the middle layers. I personally prefer fresh whipped cream, but the light stuff works just fine. And you can buy graham cracker crumbs, or you can chuck a few grahams in the food processor or blender and pulverize them yourself. Whip together the milk and pudding mix until they’re combined. Add the pumpkin and spice and mix thoroughly. Cover and refrigerate for an hour or two, until it firms up. To make the parfait, choose a glass and layer cracker crumbs, pumpkin pudding, and whipped cream, in as many layers as makes you happy. Either pop those in the fridge (the crumbs will soften up and it gets divine that way) or eat immediately (also delicious and a bit more crunchy). Sorry for the radio silence this week. Truth be told, it was one of those weeks that makes one’s head spin, and we stuck with tried & true recipes most of the time. So I don’t have much new to share with you on the food front. 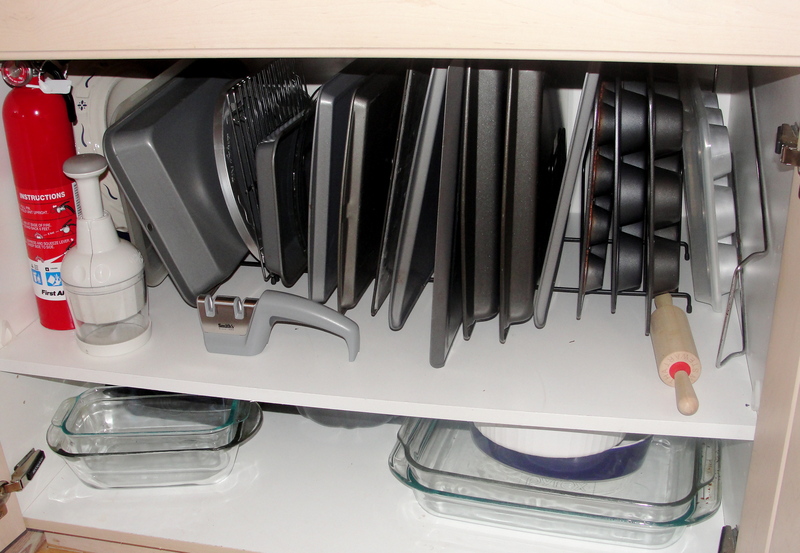 Yes, you can go buy spendy racks that will hold your pans and sheets and such like this. I went to Office Depot and spent about $6 on file racks. As long as they’re flat and not the stair-step kind, they work just fine. I can see everything, I can grab what I need, and nothing crashes to the floor. The bottom shelf is pretty simple. While stacked, it’s organized–the things I use once or twice a year are in the back, and those I use more regularly are in the front. ps–I know you see things that aren’t pots and pans. My chopper and knife sharpener are handy and happy in there, and that’s one of three fire extinguishers in my kitchen. If you don’t have at least one, close your computer right this second and go. Serious business–a family we know lost their kitchen and almost their house from a stove fire three weeks ago. So off you go–stay safe!